The only books on architecture to survive from antiquity are De Architectura by Vitruvius. The ancient Roman architect, Marcus Vitruvius Polli, emphasised that any building must have three attributes: strength, usefulness and beauty. Renaissance ideas of mathematical proportion and harmony, were expressed in the black and white marble floor was used by Inigo Jones in the cubic hall of the Queen's House in the grounds of Greenwich Palace and also by Sir Christopher Wren in St Paul Cathedral. 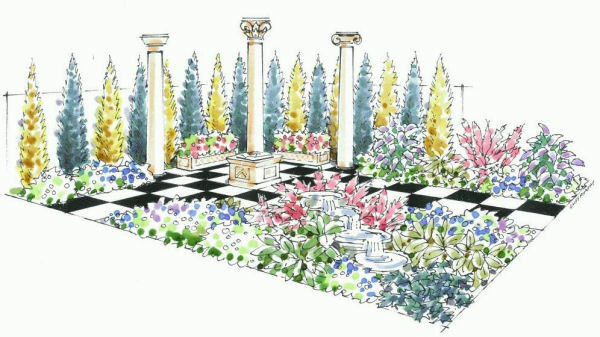 The Freemasons of Cheshire presented a specially designed Masonic garden entitled: On The Square at the 2008 RHS Flower Show. 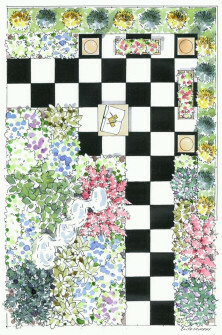 The garden expresses the symbolic meaning of Freemasonry, through colours, plants, shrubs, trees and a waterfall. The black and white chequed pavement points out the diversity of objects which decorate and adorn the creation. The three great stone columns with Doric, Ionic & Corinthian chapiters, represent Wisdom, Strength and Beauty. The letter S in ancient Hebrew script is a fall of water. On the pedestal is an open English Bible. In regular freemasonry an open volume of the whole English Bible has to be present before we begin, and remain open whilst the lodge work is done. If any candidate wishes to take his obligations on another sacred book he may do so but that must be on, or beside, the open English Bible. It is the constant presence of the open English Bible, which mainly dictates that a lodge is regular. The square and compasses are symbols of the moral lessons derived from the English Bible, which form the code of conduct for freemasons. Together they constitute the three great emblematical lights in freemasonry. Many of the features embody aspects of the long and distinguished Masonic heritage. The flowers are purple, blue, and crimson, the colors used by Hiram Abif of Tyre in King Solmon's Temple. After the RHS Flower Show, the Freemasons of Cheshire donated and rebuilt their garden in a peaceful corner within the grounds of the East Cheshire Hospice, in Macclesfield. Charity plays a central role in Freemasonry. Charity is said to be the distinguishing characteristic of a Mason's heart and every new Freemason is taught: "Charity, like its sister Mercy, blesses him who gives as well as him who receives."